Allow the Tamil people, both in the conflict zone and those indefinitely detained in concentration camps, to decide independently where they wish to reside. 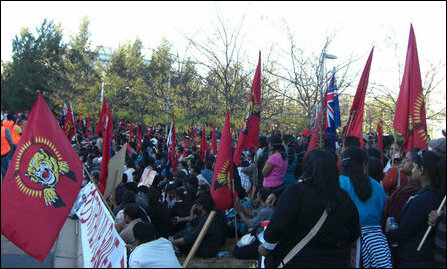 The hunger strike and the continuous protest started in Paramatta, Sydney and then proceeded to Prime Minister’s residence where hundreds of protesters stayed the whole night outside Kiribilli House without relenting to police pressure. 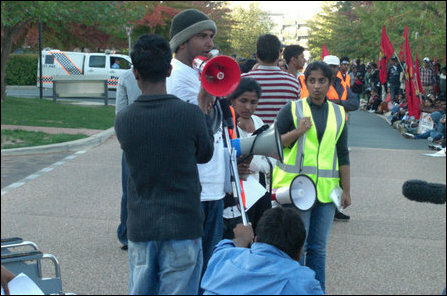 After receiving unprecedented media coverage, the hunger strikers and protesters moved to Canberra where they were joined by hunger strikers from Melbourne. 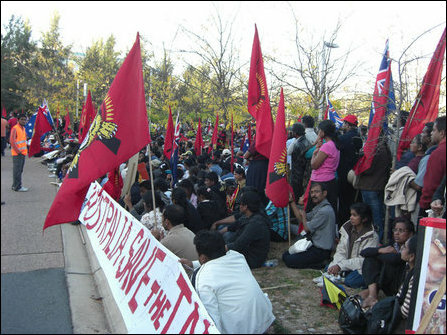 During the rally in Canberra, the extremely weakened hunger strikers in wheel chairs and more than 8500 protesters coming from more than 5 different states marched to the Department of Foreign Affairs and Trade (DFAT). Following a visit by Senator Bob Brown and assurances from the DFAT of the hunger strikers and protesters concluded the 6 day protest. 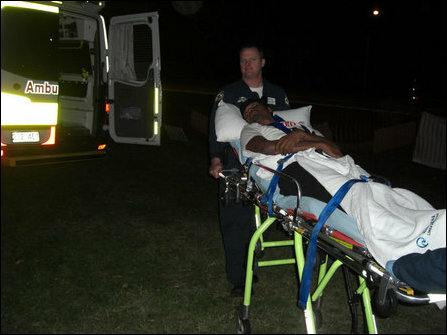 One of the hunger strikers collapsed during the rally and was taken away in an ambulance. The hunger strikers and protesters vowed more action to come. One hunger striker addressing the crowd. Collapsed hungerstriker being taken away by paramedics.